This entry was posted in Community, General News and tagged gogue, homeland security on March 1, 2012 by Wire Eagle. AUBURN – U.S. Department of Homeland Security Secretary Janet Napolitano has appointed President Jay Gogue of Auburn University to the Homeland Security Academic Advisory Council. The new council, comprised of prominent university presidents and academic leaders, is charged with advising the Secretary and senior leadership at the Department on several key issues. The new council underscores the Department’s commitment to working with the academic community. In this noteworthy role, Gogue will provide advice and recommendations on issues related to student and recent graduate recruitment; international students; academic research; campus and community resiliency, security and preparedness; and faculty exchanges. Gogue began his tenure as Auburn University’s 18th president on July 16, 2007. The Waycross, Ga., native is a two-time Auburn graduate, receiving a bachelor’s degree in 1969 and a master’s in 1971. In 1973, he earned a doctorate from Michigan State University. Shortly after returning to his alma mater, President Gogue engaged the talent and insight of the Auburn family to develop a dynamic and forward-looking strategic plan to guide the university into the future. Auburn has accomplished more than half of the plan’s objectives to strengthen academics, research and outreach, develop human capital and improve operational efficiency. During his tenure, the academic strength of each freshman class has exceeded the previous record, surpassing in 2010 the goal set for 2013. Other key accomplishments include a new research center in Huntsville, Ala., a common book program that generates a shared academic experience, outreach partnerships with underserved schools in surrounding communities, and the opportunity for undergraduate students to earn credit toward a master’s degree. His leadership during reductions in the university budget protected Auburn’s academic quality and prevented elimination of academic programs. 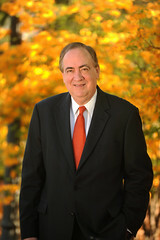 Prior to arriving at Auburn, President Gogue served as president of New Mexico State University beginning in 2000 and, in 2003, he was named president of the University of Houston and chancellor of the University of Houston System. President Gogue started his higher education administration career in 1986 at Clemson University where he served as vice president for research and vice president/vice provost for agriculture and natural resources. Utah State University selected him as provost in 1995. He is a member of Phi Kappa Phi and Golden Key honor societies, Sigma Chi Fraternity, Sigma Xi scientific research society and the National Society of Scabbard and Blade, the honorary military society for all branches of service.